So now that you have decided you want to have an elegant outdoor wedding, the first thing you need to decide is what type of tent you want. 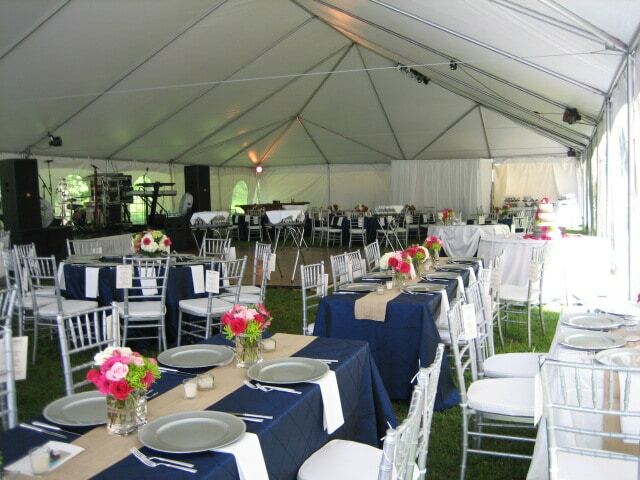 Here at A Grand Event we offer two types of tents: Pole Tents and Frame Tents. Both tents have their own unique features, but in the end it depends on YOUR preference of what look you prefer. Pole Tents, also referred to as tension tents, have a more elegant look to them with their higher peaks and dips. They are constructed by driving stakes into the ground and then hoisting the canopy up with large center poles. These types of tents can only go on grass. Most people who choose these types of tents, do so because of the classic look this tent has from the outside as well as not having any interior poles visible on the inside of the tent. 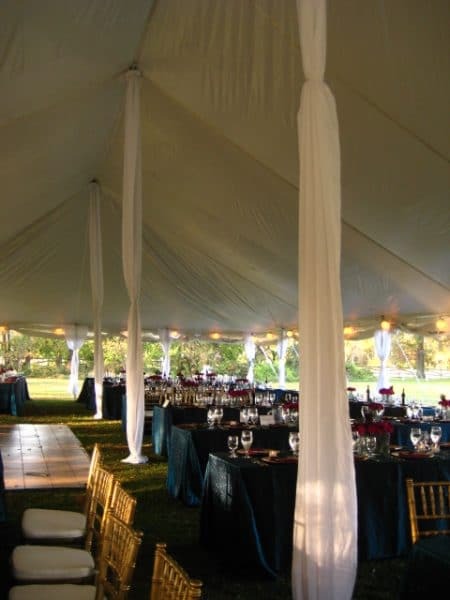 However, the center poles that come down in the center of the tent can sometimes be thought of as an inconvenience to what is going on under the tent. 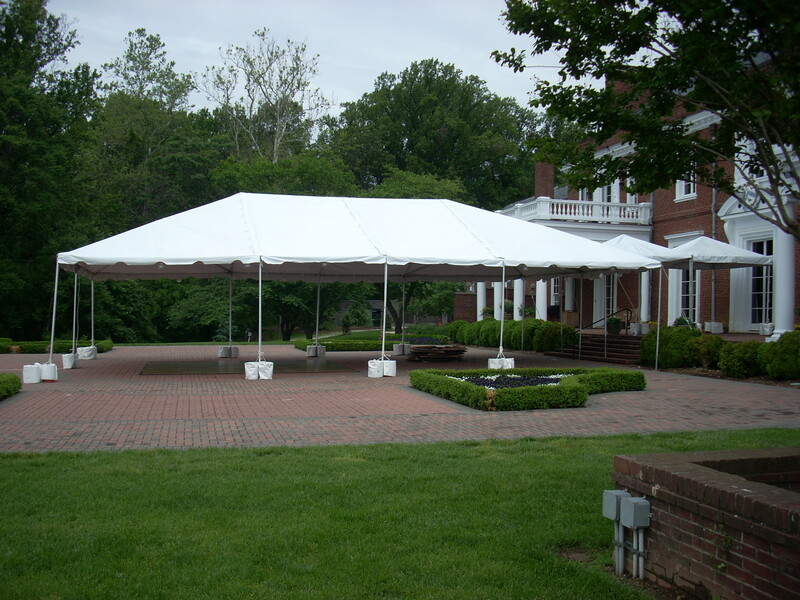 Frame Tents are free standing structures that are able to go on grass, concrete, asphalt, decks, and rooftops. They do not have poles that come down on the interior of the tent, however they are more expensive due to the labor involved in setting them up. The aluminum poles are visible in the interior roof of the tent, however that can be covered by one of our elegant tent liners. 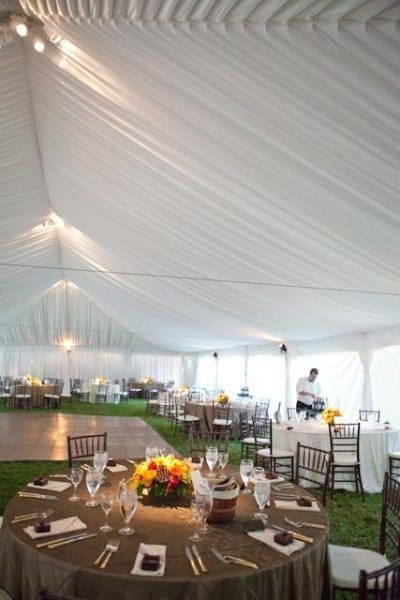 Now that you have decided the type of tent you want, the next step is to determine how many total guests you are expecting at your event. Once you know about how many guests are to be expected, the next thing you want to do is determine what type of event you are going to have. Consider any of the following needs when considering what size tent you will need. Add up the total number of square footage that is needed for your event. Refer to the following chart to match your square footage needed with the square footage provided by the following tents. If your are in between tents, it is recommended to go to the next size up tent because it is always better to have a little extra room than not enough room.